Test Explorer can run tests from multiple test projects in a solution and from test classes that are part of the production code projects. Test projects can use different unit test frameworks. When the code under test is written for the .NET framework, the test project can be written in any .NET language, regardless of the language of the target code. Native C/C++ code projects must be tested by using a C++ unit test framework. Select the individual tests that you want to run, open the shortcut menu for a selected test and then choose Run Selected Tests. 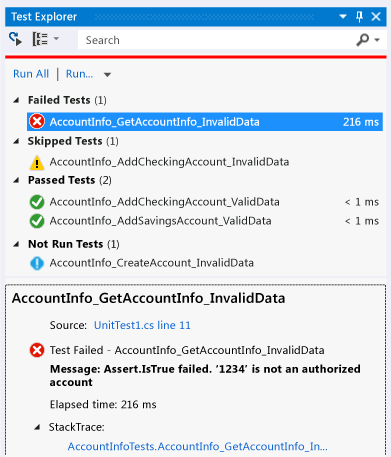 Running unit tests after every build is supported only in Visual Studio Ultimate. To display the source code for a test method in the Visual Studio editor, select the test and then choose Open Test on the shortcut menu (Keyboard: F12). Groups test by execution time: Fast, Medium, and Slow. Groups tests by execution results: Failed Tests, Skipped Tests, Passed Tests. Groups test bycategory/value pairs that you define. The syntax to specify trait categories and values is defined by the unit test framework. Groups test by the name of the projects. A trait is usually a category name / value pair, but it can also be a single category. Traits can be assigned to methods that are identified as a test method by the unit test framework. A unit test framework can define trait categories. You can add values to the trait categories to define your own category name / value pairs. The syntax to specify trait categories and values is defined by the unit test framework. The Owner category is defined by the unit test framework and requires you to provide a string value of the owner. The Priority category is defined by the unit test framework and requires you to provide an integer value of the priority. The TestCategory attribute enables you to provide a category without a value. A category defined by the TestCategory attribute can also be the category of a TestProperty attribute. The TestProperty attribute enables you to define trait category/value pair. Use the TEST_METHOD_ATTRIBUTE macro to define a trait. Use the predefined Owner trait to specify an owner of the test method. Use the predefined Priority trait to assign relative priorities to your test methods. When you type a string in in the Test Explorer search box and press ENTER, the test list is filtered to display only those tests whose fully qualified names contain the string. Searches both trait category and value for matches. The syntax to specify trait categories and values are defined by the unit test framework. Searches the test project names for matches. Searches the user-defined error messages returned by failed asserts for matches. Searches the fully qualified file name of test source files for matches. Searches the fully qualified file name of test namespaces, classes, and methods for matches. Searches the user-defined error messages that are written to standard output (stdout) or standard error (stderr). The syntax to specify output messages are defined by the unit test framework. Searches the Test Explorer category names for matches: Failed Tests, Skipped Tests, Passed Tests. In Test Explorer, select the test methods and then choose Debug Selected Tests on the shortcut menu. Unit test code coverage is available only in Visual Studio Ultimate and Visual Studio Premium.